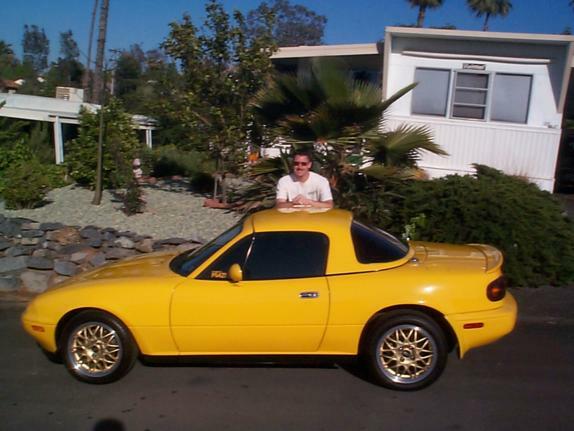 Congratulations to Geoff on his selection as our Featured MX5 Miata! This is the story of my years of Miata ownership and, more specifically, the building of STOrm (my '97 STO Edition). Between my partner and I, we have owned ten Miatas. My first one was a '92 Silverstone "B" package purchased as a lease return in October 1995. I had many fond memories during my short one year of ownership. I sold it when I changed jobs and could not continue the payments. It was a sad day. But the Miata bug was deep within me and I knew Id own another Miata one day. In February of Y2K I made the move. 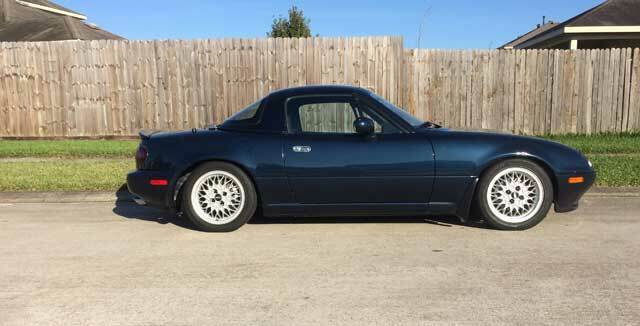 I searched far and wide and looked at many listings until I found my all time favorite Miata. He was a '92 Sunburst Yellow that I dubbed "Little Amarillo". Shortly there after I also met my partner, Xavier, and we joined the San Diego Miata Club. I built up Amarillo over four years and put many miles on him while attending many SDMC runs and events. I made so many friends and stay in touch with a handful of them to this day. 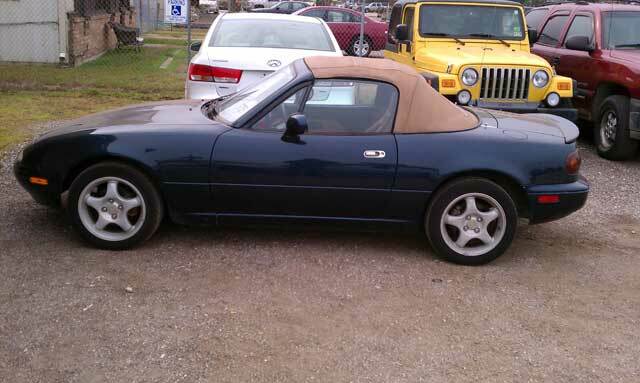 We also bought another Miata (a BRG) for Xavier. We, and our Miatas, were quit a pair for several years. In 2004 I had the opportunity to purchase a low mileage NB and made the move. The next month we purchased another NB for Xavier. Yes, if you are counting, we did have F-O-U-R Miatas at one time! Sadly, I also lost sight of the beauty within Little Amarillo and he was sold and relocated to the Pacific Northwest. In 2005 we relocated from Southern California to SE Texas. We brought three Miatas with us. We purchased our first home together and sold off two more of the small collection. Xavier did keep his highly modded BRG many more years. Alas, it is now gone as well. 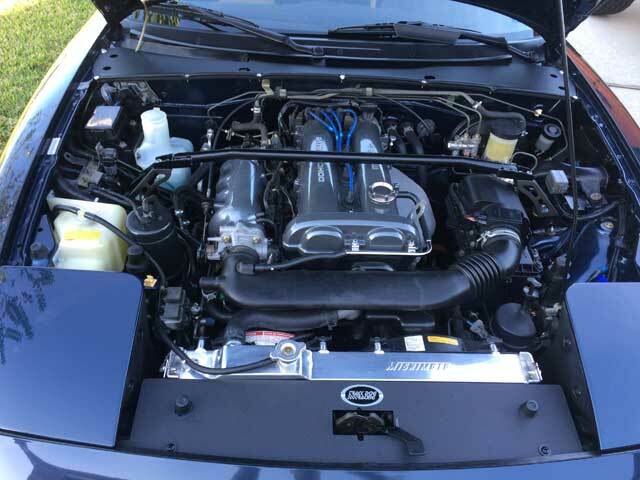 We owned two other NAs, a brand new VR Mazdaspeed and a brand new 2006 NC GT over the course of seven more years. The last one was my NC GT that got sold in 2012. We actually were Miata-less for a period of just over sixteen months. I missed the community and all the fun that roadster ownership brings. I began looking again for a suitable platform to build my next project, knowing it HAD TO BE an N/A. I found STOrm and purchased him on New Year's Eve of 2013. This time I think I will be keeping my little gem a good long while. Considering the funds invested over two short years, my partner seems to think so too. I often refer to STOrm as my "Million Dollar Miata". 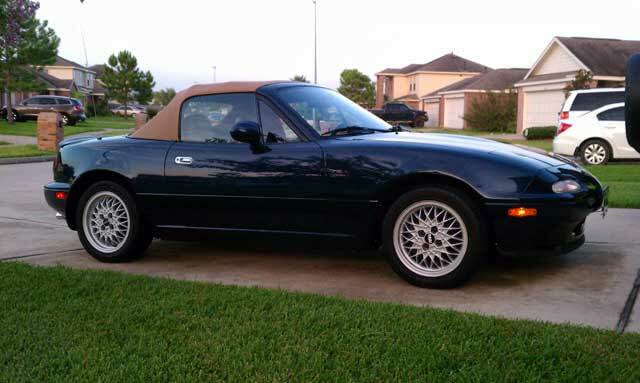 I began by taking STOrm to Gashead Motorworks (a local Houston Miata specialist). There he got a complete baselining including TB / WP, all new hoses, aluminum radiator, a rebuilt cylinder head, powder coated valve cover and intake manifold, new tan soft top and front and rear "R" package replica skirts to compliment his OEM rear trunk spoiler. Cha-ching!!! A few months later I was casually searching and emailing fellow enthusiasts trying to locate a set of 15 M Edition BBS wheels. What I ended up with are a set of single piece BBS RA wheels originally used on the early 90s VW GLi. My Sunburst had a very similar set, but in gold. A connection to the past. The silver finish on this set is a terrific compliment to my Twilight Blue hue. I waited about eight more months while I replenished the bank account just a little. Then I got the urge to buy a hardtop. What a shame and waste since I had just put on a beautiful tan soft top. It took about a month to locate the right example. I wanted a top that had an original dark blue shade right from Mazda. I found it five hours away near FT Worth, TX. It is not an exact match, but close enough until I can get it refinished next year. Again, I waited six more months before making another large investment. This time I took STOrm back to Gashead Motorworks for installation of my Hard Dog DD roll bar (same bar as in my Sunburst), new Bilstein shocks, Eibach springs and FCM bump stops along with NB mounts and necessary pieces. He now handles and rides smooth. However, the front stance is a little lower than I'd like. I am adjusting to it. While in the shop, I also upgraded the clutch to an ACT unit and did a performance brake overhaul adding stainless lines. In between phases, I have purchased numerous smaller accessories. Examples include black finished aluminum radiator & windshield cowl panels. I also ordered a complimentary set of blue and light tan colored Coco mats. As well, there is the polished aluminum fuel lid from an M Netter and an OEM power antenna was wired in. Future plans include a slight interior remake. Although STOrm's cockpit is fairly clean already. Aluminum accents abound including pedals, shift knob, brake button and air vent rings. 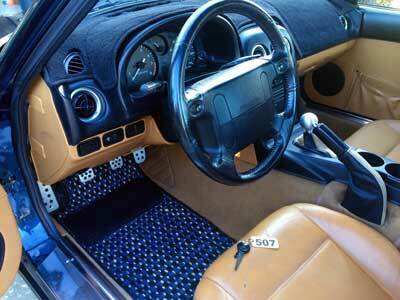 I have new leather seat covers and new / used but better carpeting. While doing this update, I may have the heater core replaced as well. The hardtop will get a respray and new seals at some point. I will likely have a few areas of the paint and body touched up too. Maybe in a few more years it will be time to source a power enhancement in the form of a supercharger! STOrm is number 507 is a series of 1500 STO Edition Miatas built to commemorate the end of the N/A series and clear the shelves of leftover "special" parts (inside joke many of you are aware of). I am fortunate to have the original numbered plaque. I also had custom key chains, license plate frame and visor plugs made for me.